Why Should You Take Up Competitive Dancing? The thrill of competition, to those that embrace it, is often unlike anything else. Distance runners love the excitement of giving it their all and passing another runner right before the finish line. Swimmers are bent on shaving literal milliseconds off of their swim times. Scoring that winning point to tip your team over to victory? There’s just nothing quite like the feeling of competing — and subsequently winning, of course! At our ballroom dance studio in Woodbridge, we’ve seen many dancing novices catch the “dancing bug” and go from clunky and uncoordinated to confident and sharp in their moves. As these dancers improve over time, they may find that social dancing or traditional ballroom dancing may not be stimulating enough to meet their desire for competition. Logically, we encourage these special students to take up competitive dancing in Woodbridge. Here are some notable benefits that accompany our competitive dance classes and competitions. With competition comes the desire to improve. Improvement also comes from practice and repeated exposure. By participating in competitive dance classes and competitions, you naturally get better at dancing simply because you’ll be doing it a lot. Yes, you may be too hard on yourself from time to time, and the improvement won’t come easily, but overall, you’ll be on an upward trend of improvement. We’ve written about some of the health benefits of dancing before, which naturally come from taking any one of our adult dance classes in Woodbridge. When you step things up to the competitive level, however, you’ll be dancing harder, burning more calories, and using your muscles in more complex and demanding ways. As such, your flexibility, balance, upper body strength, core strength, and aerobic capacity will naturally get better. Receiving a critique from a dance competition judge can be a difficult pill to swallow — receiving any form of criticism can be hard for just about anyone, as it’s a blow to your ego. However, our competitive dance instructors would assert that learning how to respectfully accept criticism, and effectively incorporate it into your dance practices, is a life lesson. When you’re working hard toward something and you’re told that you’re simply not good enough, hearing this can be devastating. Unfortunately, that’s just the nature of competition, but it’s extremely important to note that criticism from competition judges isn’t personal, and it’s intended to help you in the long run. With dance competitions and events comes travel, networking, meeting new people, and embarking on new experiences. Who knows whether you’ll meet your new best friend, or find someone that’s on the exact same level as you, dance-wise? You’ll never know until you start competing! 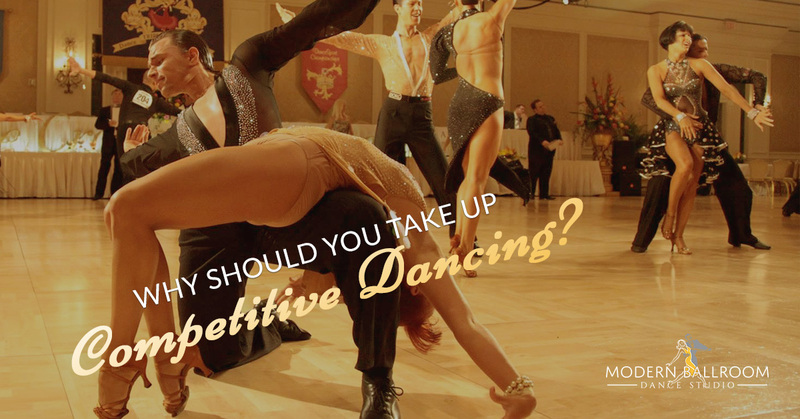 At Modern Ballroom Dance Studio, we fully embrace all types of dancers, and that includes ones with a competitive flair. Learn more about our competitive dance classes today!